Prem Rawat began his career as guru in 1966 when he was declared to be the Perfect Master and Lord of the Universe on the death of his father who held those positions before him. In 2016 he had been hoeing his row for 50 years and his remaining followers even organised some celebrations in honour of his "great achievements." Prem Rawat aka Maharaji claims to have a powerful and unique message - that peace begins with each of us, is within inside of us and that he can reveal 4 simple meditation techniques that allow us to go inside and find the joy and peace. This message is about as un-unique as it is possible to be. It is particularly strange that Rawat would make this claim of uniqueness when there are so many famous and well-known people saturating popular culture with this very message. There are also hundreds of thousands of unknown yoga teachers, mindfullness meditation teachers and all the other anonymous people of many faiths making this very statement. Of course they do not agree that Prem Rawat has any claim to uniqueness or power to validate his claims, quite the contrary. Prem Rawat is a failed and forgotten divine wannabe hanging onto the rump of his former devotees and making a relative fistfull of money while doing it. These objectives are difficult to balance together as there are inherent conflicts between them. Judging by the resources and subterfuges that have been used to try to gain him public respect and respectability over the years since that time he must feel the desire for public respect very strongly. It must hurt knowing that his eldest brother stole his birthright and has gone on to publicly succeed in Indian politics and as a guru/Godman and inherited their father's legacy, property, organisation, followers and wordly goods. 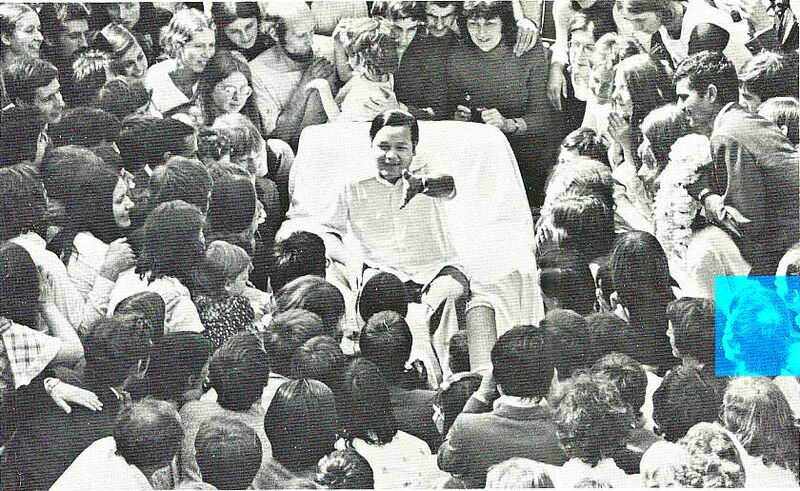 In 1971 when Prem Rawat was roaming the USA looking for anyone who would listen to him there was a photograper with him. In a photo of a small group of people asking questions published in the Divine Light magazine there was something really unique … a bald spot. That young man was suffering early onse baldness while all around him where healthy, shining heads of male hair. 43 years of meditation later its 2014. This photo published on a Prem Rawat official site is of a crowd of his faithful premies listening to him speak. The 2 major public bodies that receive donations to aid Prem Rawat's objectives (whether publicly stated or otherwise) are the Prem Rawat Foundation and the Words Of Peace Global Foundation (Stichting WOPG) based in Holland. Before the creation of WOPG in 2013 Prem Rawat used Elan Vital as the names of his national organisations and Elan Vital (US) was the major public vehicle for donations. Examination of their annual reports allows an assessment to be made of the success of his attempts to gain followers over the 50 year period since his incarnation as the current, divine Perfect Master of the Universe. While there are national organisations in many countries their donations are relatively minor. Apart from the USA the Western country with the largest number of followers of Rawat's is Great Britain. Human Development Through Self-Knowledge is the British organisation financing Prem Rawat's activities. Their financial records show that national organisations are not the major source of finance for Rawat. The total public income of the 3 major fundraising organisations working for Rawat in 2014 & 2015 averaged $6,610,319.50 per annum. The number of people donating money was approximkately 10,000 and they are donating around $12.50 per week. This is probably not all the money donated to Prem Rawat as he has some wealthy followers who receive personal access to him though a loosely organised Major Donors Club and direct donations through EFT is available. 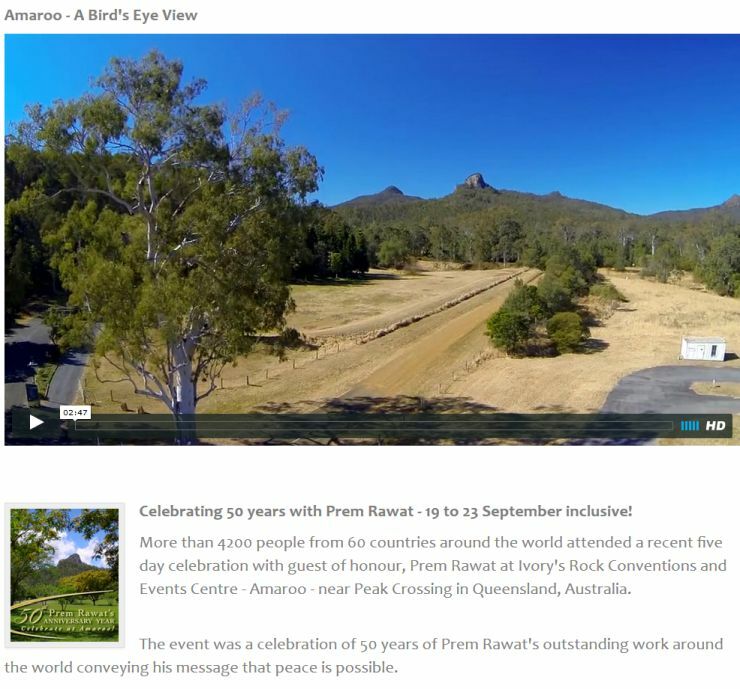 In September 2016 "a celebration of 50 years of Prem Rawat's outstanding work around the world conveying his message that peace is possible" was held at the Amaroo cult compound in Peak Crossing Australia. 4,200 devotees for many countries spent 5 days camping and glamping at or near the Centre aka Ivory's Rock Conventions and Events. This is a reasonably expensive holiday but the overwhelming majority of Rawat's Western followers were from the middle class. 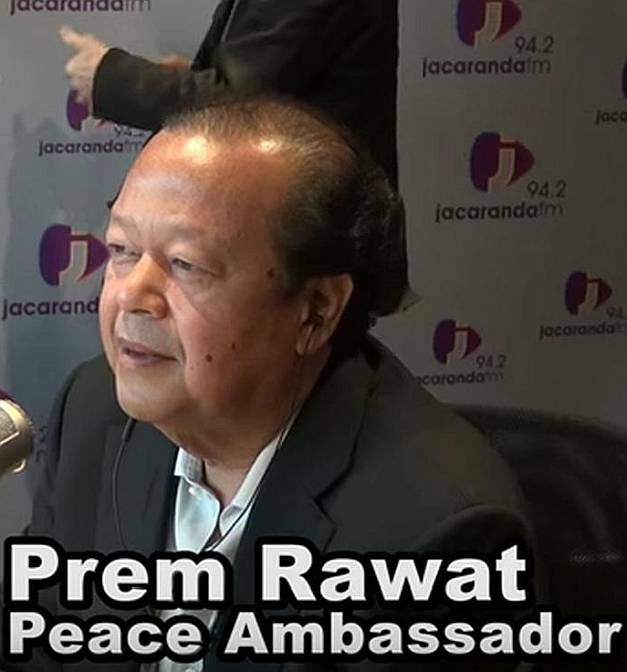 As a young boy and man, Prem Rawat promised to bring peace to the world. Literally. Not just personal peace, not just to parts of the world but peace on earth. And he said it would be easy for Him. These boasts were as ridiculous as He was Himself. Possibly the most outlandish part of his persona is his strutting around the world, displaying himself to his small group of followers and accepting their adulation and accolades for his "outstanding work around the world conveying his message that peace is possible." For all but his loyal devotees Prem Rawat's 50 year public career can only be seen as a failure. He tries to hide his claims of divinity during the first 15 years of his career but it was while obeying the script that he had been taught as a child and using the excitement and exuberance of his young counter-culture devotees that a following developed in which over 20,000 people would gather to see and hear him and consider themselves fortunate to kiss his feet him. 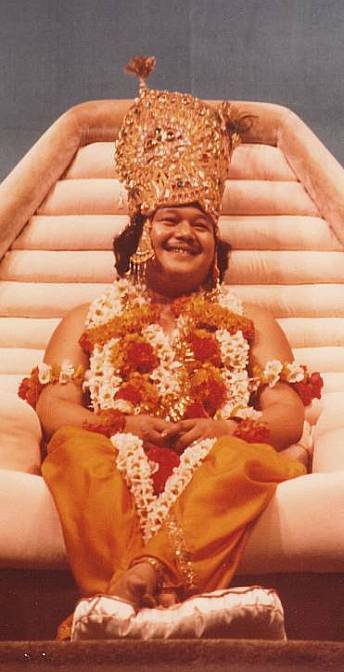 In the early 1980s, the 25 year old decided to go his own way and after another 35 years of touring and speaking and proselytising, financed by his diminishing group of devotees, he can only attract a crowd of around 4,000. This is despite the cost of international travel being much cheaper than 35 years ago. This is truly an outstanding failure and the core of his followers are now starting to die of old age.